Now that spring is nearly here, why not try some duck? Trim the duck marylands of excess fat and cut them into thigh and drumstick. Season the duck generously with salt and pepper. Roast the duck pieces on an oven rack for 15 minutes to render away some of the fat and turn the skin crisp and golden. Remove from the oven. Score the chestnuts. Boil a pot of water and cook the chestnuts for 15 minutes. Remove one at a time and peel off both layers of skin. Slice and set aside. In a large heavy-based pot, add the oil, onion, garlic, bay leaf and a little salt. Gently sweat over medium heat, then add the zest, leek, carrot and celery. Stir well then cook over medium heat for 15 minutes or until golden. Add the thyme, duck, verjuice, mandarin juice and allspice and simmer for 5 minutes. Add enough stock to cover well and simmer for a further 40 minutes until the duck is about to fall off the bone. Cook the pasta according to packet instructions, if using. 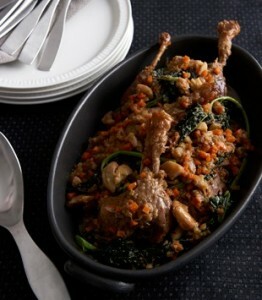 Remove the duck from the pot and add the cavolo nero. Continue cooking over medium heat for about 20 minutes, to cook the cavolo nero and reduce the sauce a little. Tear the duck meat from the bones while it’s still warm, skin and all but no gristle, and return to the sauce. Season the ragu with lots of pepper. Add the chestnuts and the cooked pasta or gnocchi, if using. Add some peeled mandarin rounds and offer parmesan cheese grated at the table. 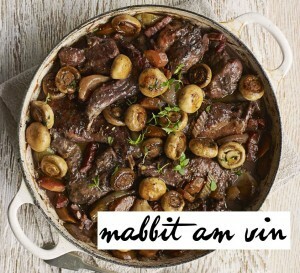 Let us take you on a French inspired adventure in your kitchen! Soak the shallots in boiling water for 5 mins, drain, then peel – this makes it a lot easier to remove the skins. While they are soaking, slice the rest of the vegetables. Heat a large, wide flameproof casserole dish, then add the lardons. Fry for 5 mins or until the fat has run from the meat, then tip in the vegetables and cook for 10 mins until golden and starting to soften. Tip into a bowl. Toss the rabbit meat with the flour, then tap off the excess. Heat half the butter and oil in the dish, then brown half the rabbit for 10 mins until golden all over. Add a good splash of water, scrape around the dish and tip the juices into a jug. Repeat with the second batch of rabbit, but use the wine to deglaze the pan this time, letting it reduce by about a third. Add the rabbit and the vegetables to the wine, pour in the stock, stir in the herbs and bring to a simmer. Cover, leaving just a small gap for steam to escape, then simmer for 1½-2 hrs or until the meat falls away from the bones. If you like a thicker sauce to your stew, you can lift out the meat and vegetables and boil the sauce to thicken it a little. To finish, heat the knob of butter in a frying pan and cook the mushrooms with salt, pepper and a few thyme leaves over a high heat until browned. Spoon these over the stew, sprinkle with thyme leaves and bring to the table.